All eyes are on Harley-Davidson right now. When the Motor Co. dropped its bombshells earlier this week, the online motorcycling community instantly lost its collective mind. 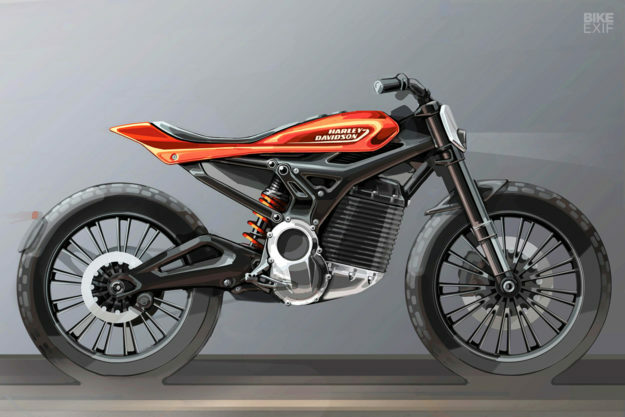 Two motorcycles stole the show: the production-ready LiveWire due next year (above), and the adventure touring Pan America (below) due in 2020. Harley also teased future ‘Streetfighter’ and ‘Custom’ models, based on the same platform as the Pan America. It’s a new platform that’ll include four displacements, from 500 cc up to 1,250 cc. Harley’s press release posed as many questions as answers. 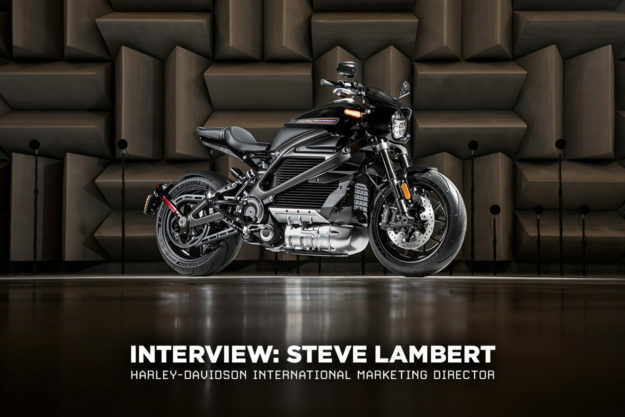 So we pitched a few curve balls at H-D International Marketing Director, Steve Lambert. As expected, he was tight-lipped on some points. 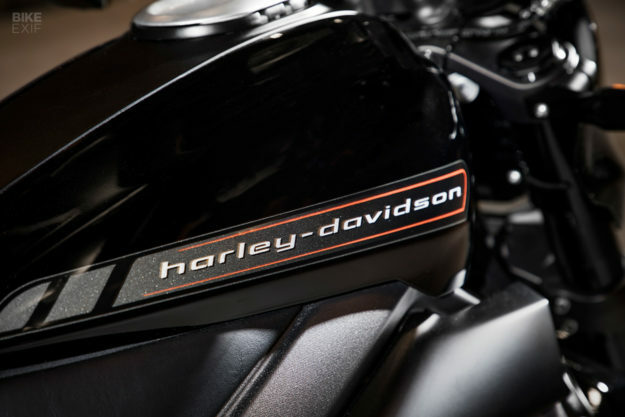 But he did explain why Harley-Davidson is branching out so suddenly, how he feels about the flak that arrives with every new model release, and what Harley’s strategy has in common with Porsche and Bentley. Bike EXIF: How close to final spec are the bikes we’re seeing in these photos? Lambert: These are not concept bikes. They are quite advanced in their engineering program. Some elements might change, but in reality these are very close to the intended final state. 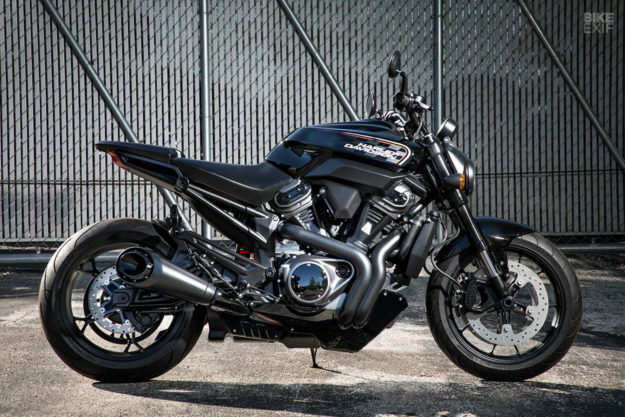 The Streetfighter looks bonkers—where did that come from? I absolutely love this bike. Brad Richards (VOP Product Design) showed me this product last year in our Product Development Centre and I nearly fell over. It is stunning. 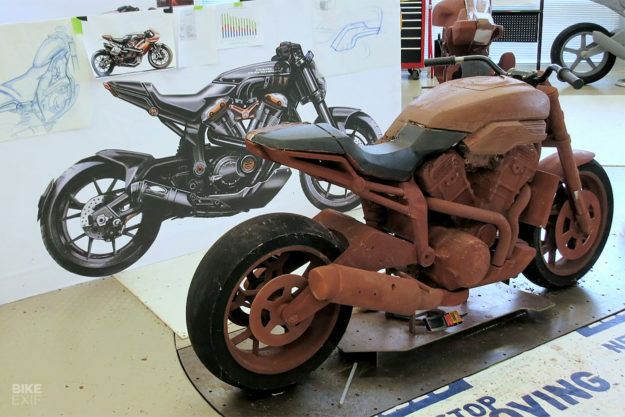 We see this segment as a big opportunity to show people what Harley-Davidson is all about. This segment is key to our growth and broadening our appeal to more people. 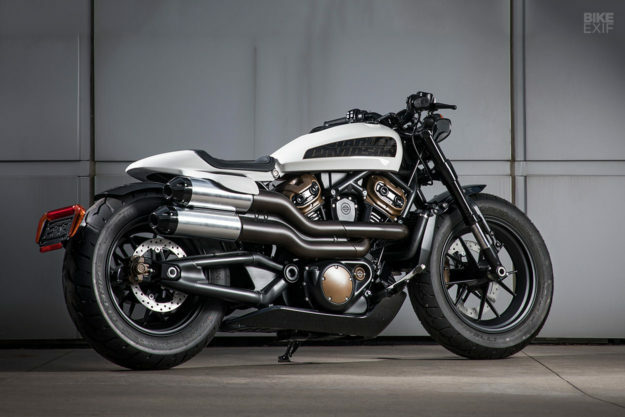 This bike screams performance, but Harley hasn’t played in this segment for quite some time. How do you change the market’s perception? Changing perceptions is very difficult. Perceptions are often not based on truth or fact; they are merely someone’s unresearched thoughts. But we can’t tell people to change perceptions. Perceptions will change based on what we do, rather than what we say. Hopefully these new models will make people who have not previously considered the brand excited about the thought of Harley-Davidson ownership. 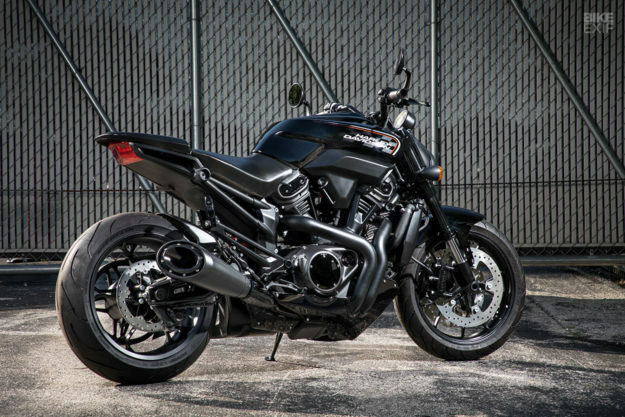 Streetfighter products attract younger customers who love the thrill of riding. Our streetfighter offer will be a game-changer for many people. The Custom 1250 (above) seems to be the most ‘traditional’ Harley in the announcement. Is this a clue to the brand’s design language going forward? You will have to wait and see. This is another stunning model with its roots in the world of custom. There is obviously a clear synergy with some of our existing models, and the custom segment is of huge importance to us. Why do all of this at once? Electric vehicles have specific infrastructure and servicing needs. Our dealer network needs to be EV ready, which takes time. Our plans for EV are much larger than just LiveWire, and our dealer network is crucial to our success. We also have to prepare our dealers, our customers, and potential new customers that Harley Davidson is entering new spaces. The car world often uses concept cars to prepare consumers. We felt that it was really important to ‘open our doors’ and let people have a peek inside and share our excitement. 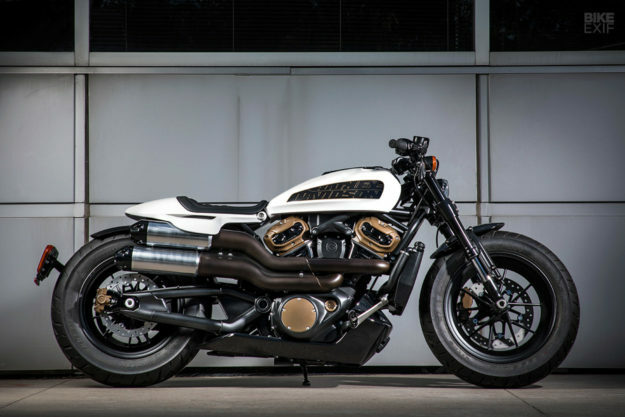 Just how wide is H-D planning to expand its offering? We are a business committed to growing the sport of motorcycling. This announcement demonstrates our commitment to entering segments that will appeal to more people. EV motorcycles and e-bikes are a perfect example of products designed to stretch the brand in new places and to new consumers. Our dealer footprint will expand into the urban areas as we strive to make two-wheel mobility accessible and appealing to more people. This includes people who may have never considered a motorcycle before. So yes, we are expanding our reach—but we are absolutely committed to build and develop new cruisers and touring bikes, which remain the bedrock of our business to our loyal customers. The LiveWire’s been on the cards for a long time, but things seem to have accelerated now. Can we assume H-D’s acquisition of Alta Motors has something to do with this? Not at all. 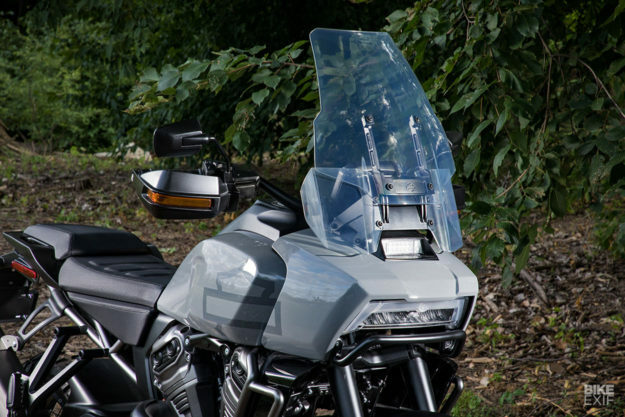 Project LiveWire was a test bed to understand how consumers would react to electric motorcycles, and perhaps more specifically a Harley-Davidson electric motorcycle. The reaction from those who rode Project LiveWire was fantastic. The technology and infrastructure for EVs takes time to develop. Battery technology moves at pace, and we are determined to lead in the growing EV motorcycle segment. Livewire will be on sale in 2019 and there are a lot of excited customers who want to take delivery. Whenever I go to an event I get asked, “When can I get a LiveWire?” LiveWire is completely on plan in terms of timings. The plans to expand into a wider range of electric vehicles are really intriguing. Can you expand on this? We are focused on expanding our community of Harley-Davidson riders, and building our next generation of motorcycles globally. Riding EV bikes is easier due to the lack of a clutch. This should make EV bikes more appealing to more people—especially in densely populated urban areas. E-bikes are an obvious gateway to motorcycles. E-bikes are great fun. There is a great opportunity for us to grow the next generation of Harley-Davidson motorcycle riders. 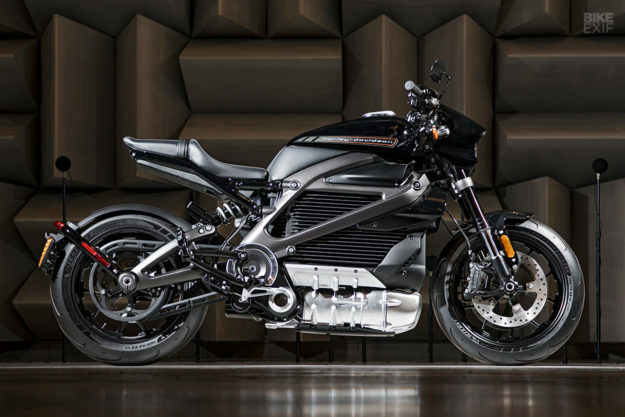 How do you think H-D loyalists and die-hard petrol heads will respond to a smaller electric bike? Is this really something that still fits the Harley mold? In 1903 the founders of the company placed a motor on a bicycle and started Harley-Davidson. We pioneered the sport of motorcycling over the past 115 years. Our future-facing plan continues on the same strategy and EV is absolutely the key direction of transportation moving forwards. There will obviously be some people who are initially uncomfortable with this, and that is understandable. 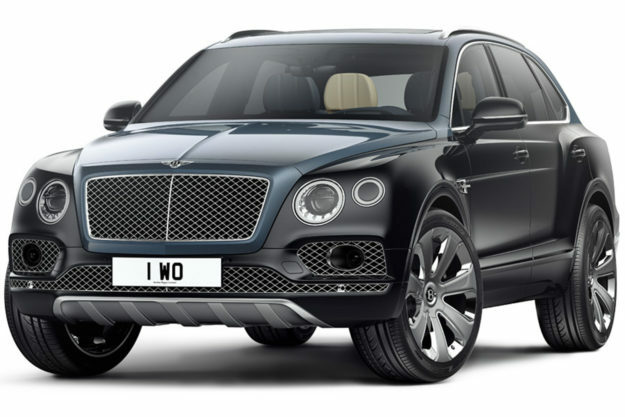 If you look at the world of cars, making SUVs was clearly a big decision for brands such as Porsche and Bentley (below). But they were future-facing decisions that were very quickly embraced by their consumers despite initial worries. Both those brands continue to invest and develop sports cars or luxury saloons. They have enabled their brand to stretch in new directions. Our strategy is no different. We will continue to serve our fantastic loyal customers with more and more premium petrol motorcycles that are rooted to our core business. Looking at the new range of 500 cc to 1 250 cc V-twins, can we look forward to the same step forward that we saw with the Softail line, in terms of power, weight and handling? Softail has set a new benchmark for us. We are entering these new segments with highly competitive products. Reading between the lines, it would seem this new platform is set to replace the Sportster and Street lines? I cannot comment on this at the moment. 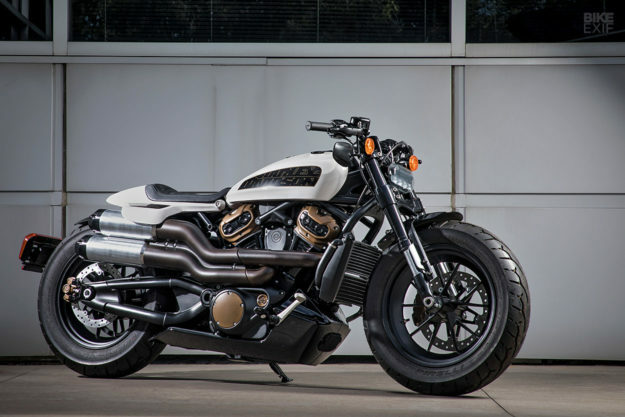 Some of the market had a knee-jerk reaction when the new Softail line (above) and the death of the Dyna was announced. Are you expecting the same sort of polarized reaction here? The one great thing about our brand is that it generates passionate conversations. Trying the new Softail was a revelation for many people who were not comfortable with the new range. This is all about new and exciting changes that broaden our offer in new spaces. It would be naive to suggest that everyone is going to be 100% supportive, but Softail customer reaction has been fantastic. Our sales are going really well. Some dyed-in-the wool H-D fans that I’ve discussed the bikes with are hating the new direction, claiming they prefer the ‘traditional’ style. Most tellingly, non-riders that I’ve shown the bikes to absolutely love them. Entering new segments can sometimes upset the balance. We are absolutely committed to designing and building cruisers and touring models that the most dyed in the wool H-D fan should love. When entering segments like adventure touring and streetfighter, there are certain codes of design that we need to follow, that don’t naturally translate from our current portfolio. The new models expand our appeal to many new customers to the brand. We need to compete in growing segments, and we need to ensure that we have the right products to achieve these goals. Our new models and strategy are supported by vast amounts of consumer research. Finding the right balance is tricky and is something that we don’t take lightly. 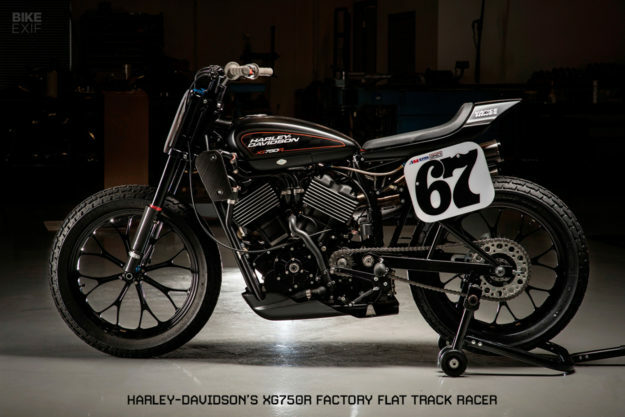 People are virtually begging for Harley-Davidson to build a factory street tracker. Are they finally going to get what they’ve been asking for? Sorry. I can’t comment on other future products at this stage. People have been clamoring for a dual-sport Harley for forever, and many have even built their own. Why did Harley never built a ‘dual-Sporty’? Why did they wait for a whole new model before dipping their toes in the water? There are many factors at play. Design and engineering resource, manufacturing resource, dealer capacity and of course financial investment. We wanted to come to the market with a highly competitive product. Pan America is just that. 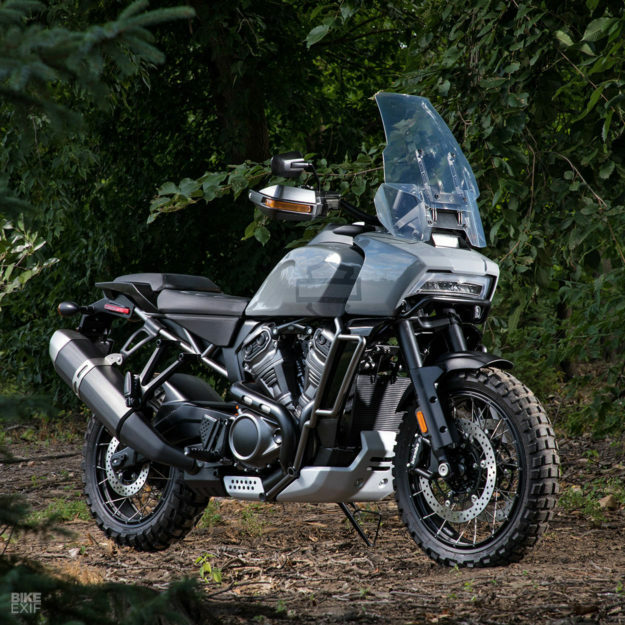 Rather than building a smaller, more aggressive dirt bike, it seems you set your sights firmly on the larger-capacity adventure touring market here. 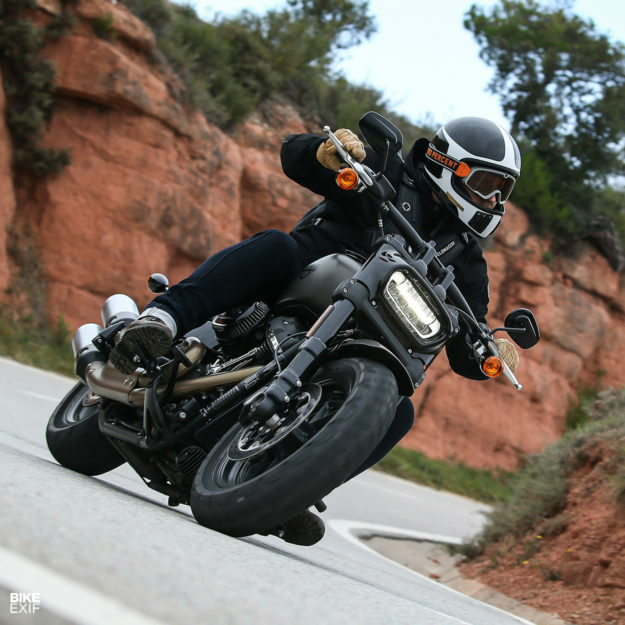 This will differ by country, but we know through extensive research that lots of potential customers want an adventure touring bike from Harley-Davidson. Plenty of people who buy adventure motorcycles come from different segments. It also indexes pretty high for people who are new to motorcycling. We will bring Harley-Davidson brand values to adventure touring, and provide a new proposition versus some of the other players in this space. Pan America will offer a broad appeal and will cater for a high percentage of adventure touring customers’ needs. 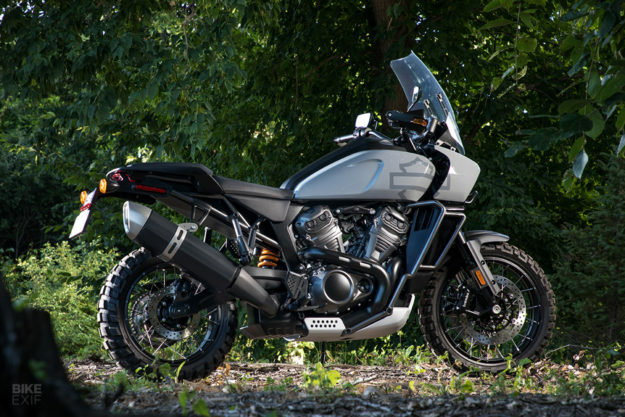 The adventure touring segment is not very large in the USA and this represents a big opportunity to grow this style of motorcycle in our homeland too. The Pan America’s design has already split opinion. What was the inspiration here? That’s a good thing. I’m very pleased that people are having debates. Design presence and attitude is part of the Pan America DNA. Individuality and freedom are what we are all about. The design team is doing a great job bringing something new to the segment, that wears the bar and shield with pride. Any radical change like this runs the risk of leaving Harley’s extensive third party aftermarket world in the dust. How do you keep things sweet for the parts manufacturers and customizers out there, who have helped keep the brand popular over the years? You can argue that the reveal of this bike so early is of great help to this community. Customization and personalization are a huge part of the ownership experience and we will continue to strive to excel in this area.